Wood Products Corporation is a full service pallet and crate manufacturer. We can bring in any form of lumber and process the material in-house. We do not use a sub-contractor, buy pre-cut parts or broker jobs as many suppliers do. We have total control from beginning design stages to completion of manufacturing which allows for increased flexibility, improved overall quality and reduced lead times. We offer expert design services, CNC machine capabilities, on-site heat treating, VMI programs, warehousing and custom packaging services. We are proud to serve a variety of customers in the following industries: agricultural, automotive, building products, forging, packaging, steel, retail, food and drug, and more. 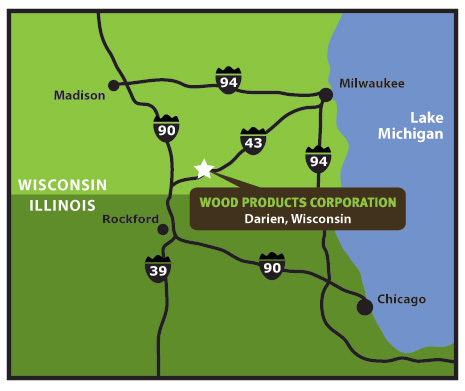 Wood Products Corporation is strategically located between Milwaukee, Madison and Chicago. We offer company owned transportation for reliable, fast delivery.